To find a vintage CPU is not easier than to find a trilobite fossil. When you plan to quit an outdated CPU, will you think to collect and display it? CPU is the essencial of human intelligence. The vintage CPU is as rare as the cultural relic,which is worthy to be collected and respected. The small object contains the great creation that surpassed the human selves. We owned the CPU, and we need to treasure up it to prove the past human honor and dream! If this is the first time you visit CPU-CN.COM, hope it can be the window for you to comprehend the development of CPU. We would like to introduce all aspects of knowledge on CPU that from world famous CPU factories. The photos showed on this web are from every one's long period collection. Wish you could love this web and introduce it to more guys. If you are also a CPU collector, hope CPU-CN.COM is the platform for you to intercommunicate with world-wide collectors and show your own collection on it. You are welcome to join the team of CPU collectors. 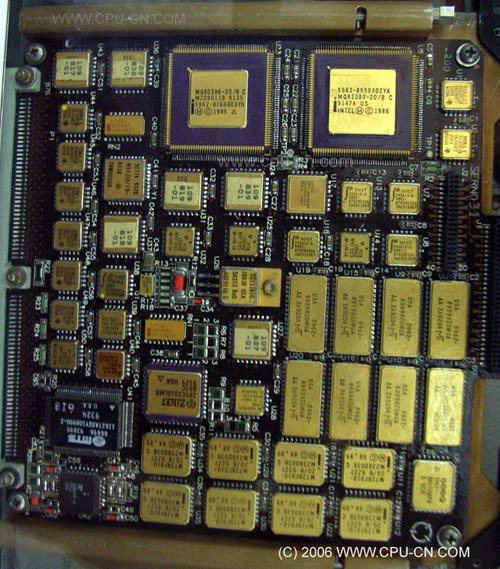 Nov.8,2006-I got an ultra-rare military MQ80386 mother board. Mar.15,2006-Got ex.rare grey trace Intel C4004 with original package. Jan.20,2006-Rare Intel C4040 has been added into my collection. Dec.1,2005-I've got Intel C4004 ,C4002-2 and C4201. Oct.30,2005-Antique software DOS1.1 and Windows 1.0 added onto downloads. Sep.9,2005-Intel A80386EXI SAMPLE was added onto CPU-CN.COM.